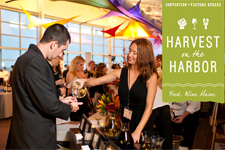 Harvest on the Harbor celebrates its 12th year as Maine’s Premier Food + Wine Festival! Eat, drink, and enjoy exceptional food, beer, wine, and spirits from Maine and around the world. Award-winning chefs, epicurean presentations, and live entertainment – all happening on Portland’s waterfront! Maine chefs and restaurants have been gaining national attention for several years now. Maine restaurateurs are proud to be part of the burgeoning farm-to-table movement, using fish, meat, organic produce, and locally grown fruit from our very own farmers, fishermen, and suppliers. When you add “bold and innovative” to “fresh and local,” you’ve described the spirit of Portland’s Food Scene and its talented chefs. Come experience many amazing chefs in one destination…Harvest on the Harbor.